When we first moved our neighbors kindly insisted we borrow their old dining room table and chairs. They had been storing it in our building’s party room for some time and wanted us to use it. It had six chairs, but the table could only comfortably dine four people. We’d get creative during suppertime as we used the sixth chair to act as overflow for serving dishes. But we were thankful. A table, even a small one, is better than none at all. A few weeks ago we picked out a new dining table with six chairs and the table space to use them. Only, we didn’t test that out right away by serving a meal on it. Instead, Marci came home from a toy store with a 2,000 piece puzzle in hand. As she proceeded to open the box and clog 92% of our new table with jumbled pieces, I asked if she was crazy. I protested that it would take us dozens of hours to complete. We were looking at two whole weeks when wouldn’t have a dining table for meals, games, crafts, projects, or anything. She shrugged her shoulders and kept on flipping pieces and looking for borders, the beginning moves of any sane person with a new puzzle. After sighing and sitting for a moment I walked across the room, pulled up a chair, and joined her. A few spots coming together in the corners. This was only my second 2,000 piece puzzle. 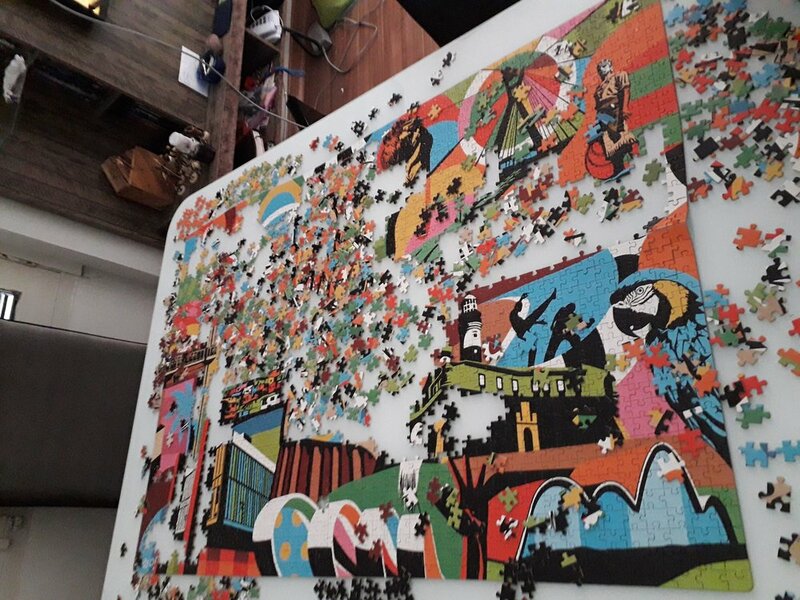 I’m no puzzle professional who prides themselves on completing a Hubble telescope photo of a black hole or someone’s painting of a cloudless sky. But I’ve done plenty of 1,000 piece puzzles and there is a huge difference when you try to do those second thousand pieces. Repeatedly, during the first half of this puzzle I could find about 17 pieces that all were decent candidates for the right fit, and I’d pile them up in a tidy stack of broken dreams after none of them worked. Every major color had similar-looking pieces and lots of them. Time stood at a standstill as minutes would fly by on my clock and I could point to two, maybe three successful fits. It’s also hot and humid here in the summer, so another hiccup was having pieces stick to my arms. Not once, but twice while searching for a particular piece for 30 minutes or so I gave up in futility only to find that very piece in the kitchen the next day. I’m amazed we finished the puzzle at all, but we did some two weeks later. From the first time I pulled up my chair to a pile of scattered pieces on my new table to when I helped Marci glue and hang the finished product on our entryway wall, I realized something. As I logged my hours little by little in the morning here, the afternoon there, and late at night, the puzzle’s beautiful picture of the country we now call home started to come together. One scene in the top right; another along the bottom; order began to emerge piece by piece from its surrounding chaos. It hit me. We were the puzzle, and moving to Brazil in November spilled us out onto something new, but day by day we are trying to piece together our new lives here. Figuring out how to drive in this corner. Going to church in that one. Coming up with a language-learning and schooling plan in the middle. And so on. There’s no shortcuts to bridging this transition and its chaos. There are no quick-fixes for acculturation and language-learning either. And sometimes pieces of your new story will wind up in the strangest of places. Let them. You’ll be even happier when you happen upon them while searching for something else. In Deuteronomy Chapter 6 Moses tells God’s people, Israel, to actively remember what God has done for them by impressing God’s works and promises onto their children by telling them constantly about what God has done when the kids wake up and go to bed as well as when they walk on the road to get where they are going during the day. Moses also tells all the people to remember what God has done by posting his promises onto their door frames. People have taken this very literally over the years and crafted tiny mezuzah’s of God’s promises that can easily fit onto tiny doorframes. We extended our doorframe to our entryway. On one side is a board that says, “Wow God,” where we post joys and thanksgivings. Right now we have posts that range from 90% support, to air conditioning, to there being Barbie movies on Brazilian Netflix. On the other side of the entryway hangs our 2,000 piece puzzle. No longer a metaphor for chaos, now it’s a glossy reminder of God’s promises fulfilled. Like this puzzle, our transition to Brazil wasn’t handed to us already complete. We’ll have to continue piecing things together as we go. But we’ve got everything we’ll ever need, just as promised. God made sure of that before we even arrived. As we leave our home to face the day’s ups and downs, we pass by these reminders of order from chaos and promises fulfilled. And later when we return home they’re the first thing to greet us. In Deuteronomy God’s people are to remind themselves multiple times a day of two truths: That our Lord alone is God, and that we are to love him with everything we’ve got. That means we are to love him whether we’re settled, unsettled, in chaos, or newly settled on the other side. Wherever you are in life’s journey may you also be reminded of God’s grace, blessings, and promises, no matter how puzzling they may seem this moment because you’ve already got everything you need in Christ. And you never know when he might show up, especially in unexpected places. Older PostWhat am I Doing Here?